Le Petit Spa Matira is located within the Coqui Coqui Boutique in Bora Bora. 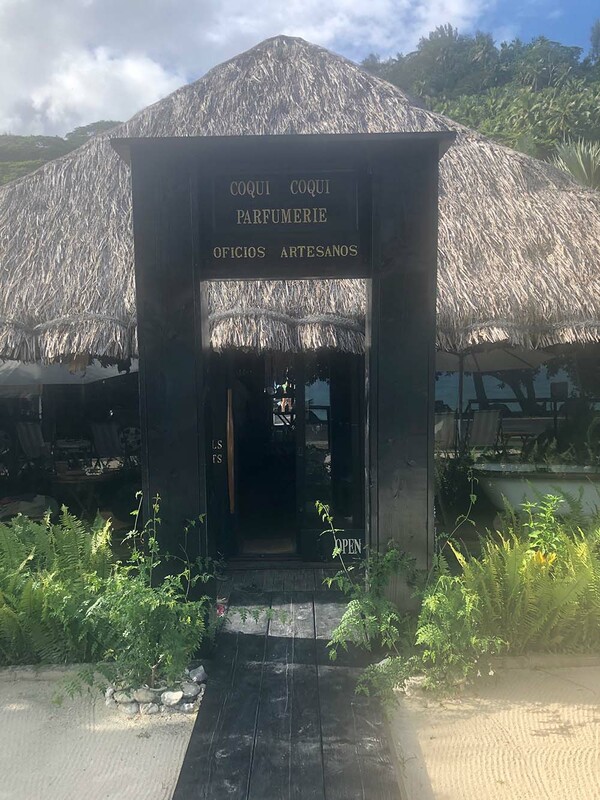 Le Petit Spa Matira is a hidden gem on the Tahitian island of Bora Bora, which I discovered during a recent visit to Coqui Coqui Perfumeria’s new boutique in French Polynesia. Coqui Coqui is an upscale lifestyle brand that offers a variety of scents and body products crafted on the belief of creating the ultimate sensory experience inspired by travel, lifestyle, and exploration. Founded in 2003 by French contemporary landscape architect and perfume Nicolas Malleville, Coqui Coqui extends beyond products with its Residences & Spa portfolio. At present, it has four hotel and spa properties in Mexico, with a fifth underway in Bora Bora. Currently, guests visiting the Bora Bora boutique can opt to receive spa services at Le Petit Spa Matira, until the larger spa opens along with the hotel. 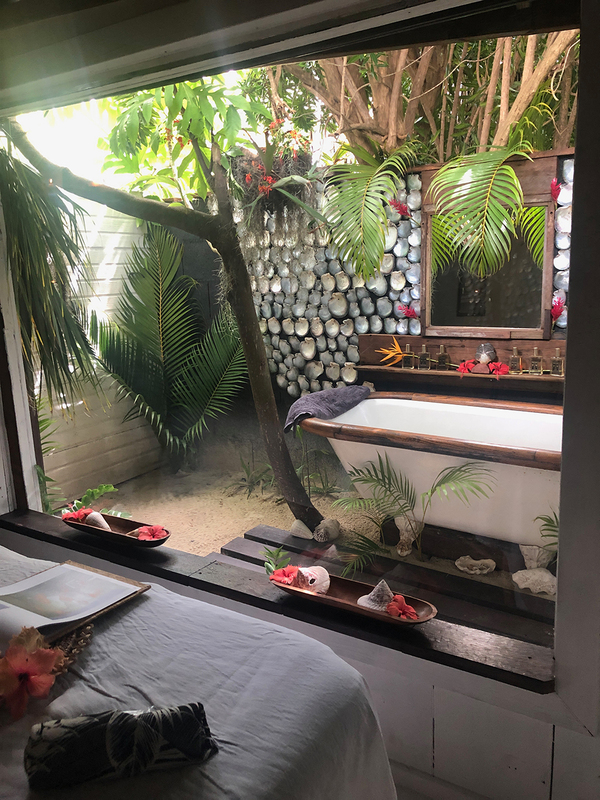 Coqui Coqui Boutique and Le Petit Spa Matira are the ultimate location for a sensory experience. The spa is conveniently located within the Coqui Coqui Bora Bora Boutique, so you can shop the entire range of products before or after treatment. Coqui Coqui products, including bath oils and fragrances, are used along with natural ingredients in all treatments. The beautifully decorated spa features Polynesian art combined with elements of Mexico’s Yucatan Peninsula. Guests can enjoy the relaxing Zen garden with an open-air bathtub. Complimentary transportation is provided to and from the spa/boutique. The spa is located directly across from Matira Beach, the largest public-access beach in Bora Bora. The spa’s relaxation lounge features a comfortable and stylish ambiance that makes guests feel at home. Discover Polynesian art and culture through refined craftsmanship, perfumes, and oils for body care. I was picked up at the Vaitape dock by Malleville, who arrived in a black island-style Land Rover featuring the Coqui Coqui emblem on the side. As a longtime fan of the brand, I was pretty starstruck to be getting a ride from the legendary perfumer himself, with whom I chatted about inspiration and future plans for the brand as he drove me to the boutique/spa, which is located in scenic Matira Beach. 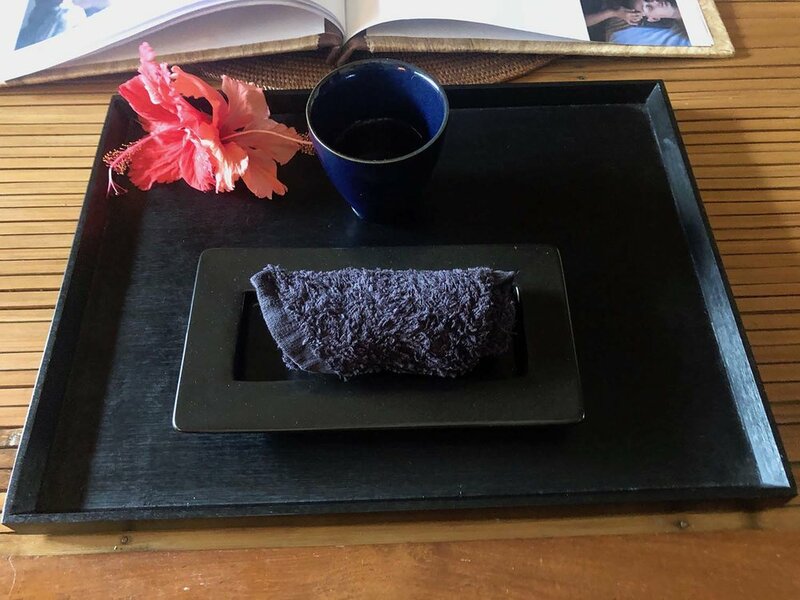 Upon my arrival to the spa, which was approximately a 15-minute ride from the Vaitape dock, my massage therapist led me through the boutique and into a stylishly appointed lounge area, where I answered a brief questionnaire about the areas I’d like her to focus on during treatment. Afterwards, she served me vanilla water accompanied by a chilled towel, which appeared to be enhanced with one of Coqui Coqui’s pleasant fragrances. Prior to my treatment, I was served vanilla water accompanied by a chilled, scented towel. There is also an outside patio area where guests can relax before or after treatments. Next, she led me into the treatment room, and I was immediately taken aback by the beautiful setting. Sea shells, flowers, fragrances, and candles lined the shelves behind the massage bed, which was decorated with flowers as well as a pareo (the Tahitian word for a wraparound skirt). The room also smelled amazing, which I wasn’t surprised by since this was a Coqui Coqui establishment, after all. A large glass window brings the outside indoors for enhanced space. I had signed up for the Earth Ritual, the spa’s 100-minute signature treatment that includes a bath, massage, and foot reflexology. 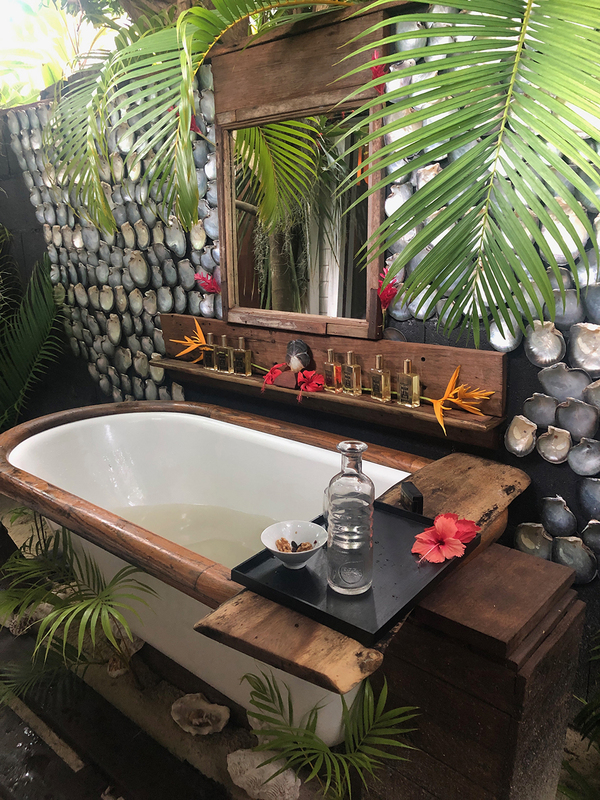 The service is dedicated to enhance a ground experience and awaken the integrity within one’s own self, and gives the guest the opportunity to discover Coqui Coqui’s bath fragrances. Before stepping out of the room, my therapist instructed me to get undressed and enjoy my outdoor bath. When I stepped outside onto the private patio/Zen Garden, I immediately felt as if I had been transported to a magical Tahitian garden. Gentle music was playing in the background to set the mood, and I eagerly stepped into the lukewarm bath, which was perfect since it was a hot and humid day in Bora Bora. The Zen Garden area features a stunning open-air bath tub. Guests can choose from the new Polynesia Collection of eight different fragrances to personalize each treatment. Because I was still recovering from a moderate sunburn (the sun in Tahiti is stronger than anything I’ve ever experience before, and I never burn), I asked for the Polynesian Medicinal Plants Bath instead of the sweet and salty coconut and flowers bath, which is included as part of the Earth Ritual. The medicinal bath features a deeply relaxing medicinal plants infusion, which heals the skin and body—and it felt very soothing on my skin. During my bath I sipped on vanilla water and snacked on a bowl of nuts and dried fruit that had been provided, while enjoying my comforting soak session. My therapist had also provided a bar of Coqui Coqui soap for me to use during my bath, in addition to pouring some of their bath oil into the water. I felt fragrant and very hydrated after my bath! The beautifully decorated massage room. After about 10 minutes, I emerged and returned to the treatment room, where I had been instructed to put on the pareo that was on the table. I lay down on the table and my therapist proceeded to remove the pareo, gently placing it on top of me and using it in place of a sheet to cover my body. Next she proceeded to give me a 50-minute Polynesian massage, where she practiced long, wave-like movements that flowed from my head to toes without interruption. She also used her forearms and elbows for added strength and depth, which helped to soften the knots in my muscles. After the massage, she performed foot reflexology for 30 minutes, which consisted of applying pressure to specific points on my feet to help alleviate stress and remove energy blockages. Reflexology is also said to be connected to specific organs and body parts through energy channels by the body, and by pressing on and stimulating them, one is promoting better health in the related body area. The treatment room features lots of Polynesian art details on the shelves. After my treatment had concluded, I felt refreshed and relaxed. I really enjoyed the intimate setting, not to mention the authentic Polynesian vibe. I was also inspired by the beautiful decor and finishing touches, from the seashell wall to the Hibiscus flowers placed throughout. 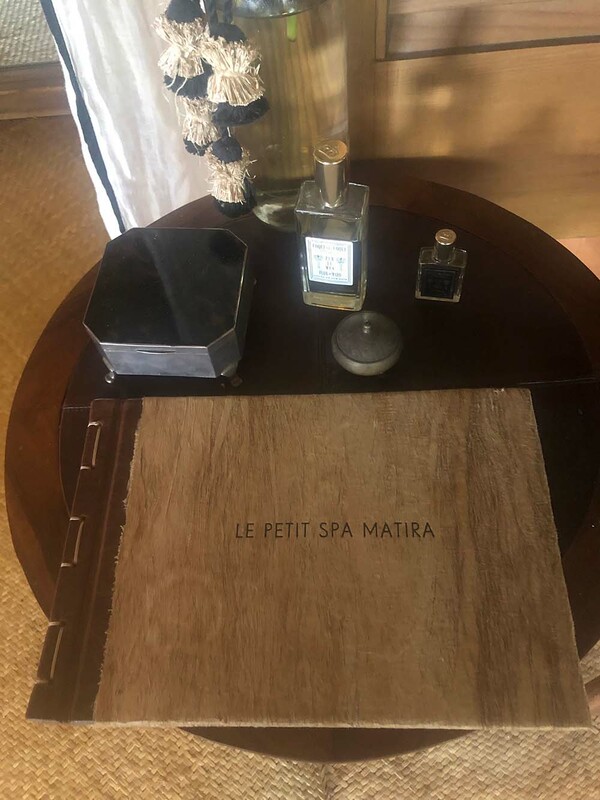 I absolutely loved Le Petit Spa Matira, and as a longtime Coqui Coqui fan—it was the perfect place for me. Not only did I get to stock up on the brand’s latest collection of fragrances and body products, but I was able to conclude my shopping session with a relaxing spa treatment! It was such a unique and special experience, and the next time I visit Bora Bora, I will make sure to come back here for another magical spa day! Coqui Coqui scents are used along with natural ingredients in all oils, lotions, and herbal blends prepared for every treatment. Every detail lends to the beach-inspired, Polynesian decor. Insider Tip: ﻿Coqui Coqui Bora Bora offers complimentary transportation to and from the shop and spa. Simply give them a call, or send an email when scheduling your services to arrange a ride.